a little about your work to my readers? Hello! My name is Esther Clark, and I am an illustrator and calligrapher based out of Saint Paul, MN. I am married to my wonderful husband Aaron, and we have a cute pet rabbit called Cromwell. My work is centered around modern calligraphy and botanical illustration. Most of the projects I create are wedding invitations for brides around the country, but I also do logo design and run an online shop with prints and greeting cards, as well. What made you want to pursue art and calligraphy and how did you get to where you are today? I have always loved art more than anything else; as a little girl, I was always drawing, painting, or molding objects out of clay. My mom tells me that I used to love drawing my own outlines and coloring them in instead of using coloring books! I majored in Visual Art in college, with an emphasis on printmaking and photography. When I graduated, I didn’t really know where to go with my degree. I worked various odd jobs for several years, but always knew I would love to do freelance design work full time. I started doing botanical drawings during this time period and fell in love with them as I had with nothing else during my studies. I slowly developed a unique style as I drew more and more! I made the decision to drop down from a five-day work week to four days and chose to use that extra time to build my portfolio. A few months later, my husband and I moved to Grand Rapids, MI, a city I had never set foot in. I am a very introverted person, so it took me quite awhile to make my first friends and also to find a new job. Once I did get a job, it was part-time, so between the lack of friends and the shorter hours, I had lots of extra time on my hands! While I had always wanted to do freelance artwork, I had no idea how to get started and felt intimidated by the idea, so I decided to start a lifestyle blog! I knew I would need to direct traffic to my blog in order to start making money from it, so I also zeroed in on growing my following on social media outlets. I quickly noticed that every photo I posted of my illustrations got much, much more attention than any of the lifestyle images on my feed. This showed me that a lifestyle blog probably wasn’t the right direction for me, and I switched my goal over from blogging to freelance work again. I realized that learning calligraphy would make me much more marketable than just illustration, so I taught myself how to use a pen and nib. My sweet husband helped me write a business plan, and I continued to market myself through social media. I definitely wouldn’t be where I am today without my husbands’ help - he is ever so much more business-savvy than I am - and I am also so grateful for the way Instagram brings me the majority of my clients! What is your favorite thing to create or project to work on? I love every facet of creating in my job, but wedding stationery holds a special place in my heart. I have always been very process-driven and love working with my hands; I have never enjoyed digital or computer work. I chose to major in printmaking because of the tangible and process-heavy nature of the medium. You start with a sketch on paper that is then transferred to a wood block in pencil, drawn over again in pen, and then carved out with a few different sharp tools. You tear your own paper, ink your own blocks, and roll every print through the press manually before finally having an end product. I loved the feel of the tools carving through the woodgrain, the smell of the ink on the block, the sound of the block being rolled through the press. That is something that has really influenced the work I do now; I still love being able to do tangible work with my hands and getting to know my materials well. 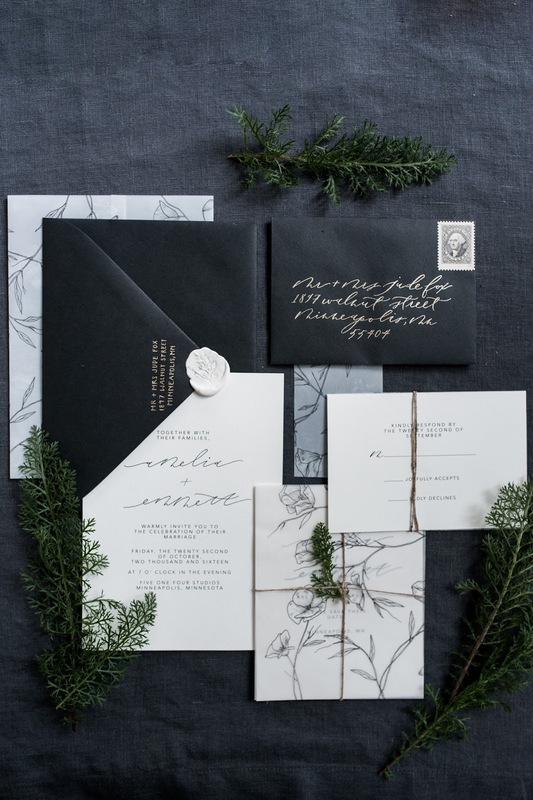 Wedding stationery is my favorite because I have to do a small amount of digital work, but the vast majority of the process is doing calligraphy and illustration by hand, as well as sourcing different papers and beautiful materials. Once the designs are digitized, I often end up printing each piece by hand - one by one - as well. What sort of things inspire you in everyday life? What are some of your interests/hobbies outside of your work? I am most inspired by natural elements; the jasmine growing on my dining room table, flowers or dried bits I find while walking, petals falling from a vase of peonies on my dresser. I also find inspiration in natural fabrics and materials like linen, paper, and marble. Even the smallest things - the way dappled afternoon light falls on the curtains or a shadow cast softly through the window - can be inspirational because of the mood they evoke. When I’m not working, you can find me going on a walk in our beautiful neighborhood, cooking/baking, reading Harry Potter, or repeat-watching British period dramas. I can’t eat gluten or dairy and have a terrible sweet tooth, so I spend quite a bit of time experimenting in the kitchen and trying to make GF + DF baked goods taste as good as the original! My personal favorite talent of yours is your beautiful botanical artwork. I have several pieces hanging in my home. What flower is your favorite to draw and why? Thank you so much!! I love seeing my pieces in their new homes! It’s hard to pick one favorite, but I find myself returning again and again to poppies and wild roses. I think I enjoy drawing these flowers for the same reasons: both are so delicate and beautiful in their simplicity. I sometimes enjoy the challenge of drawing a complex, opulent flower like a peony or garden rose, but I especially love drawing flowers that are more understated and graceful. I try to incorporate minimalism into most of my designs, and that’s much easier to do with simple flowers. I am also very drawn to the flowing lines and tangles that can be created with the thin stems and leaves that can be found on both wild roses and poppies. I understand that your husband is about to open a coffee shop in your area. Clearly, you both are very driven and passionate about what you love. Will your work carry over into his coffee business? his choice a little bit! I hope you enjoyed getting to know Esther and will come to admire her work as much as I do! 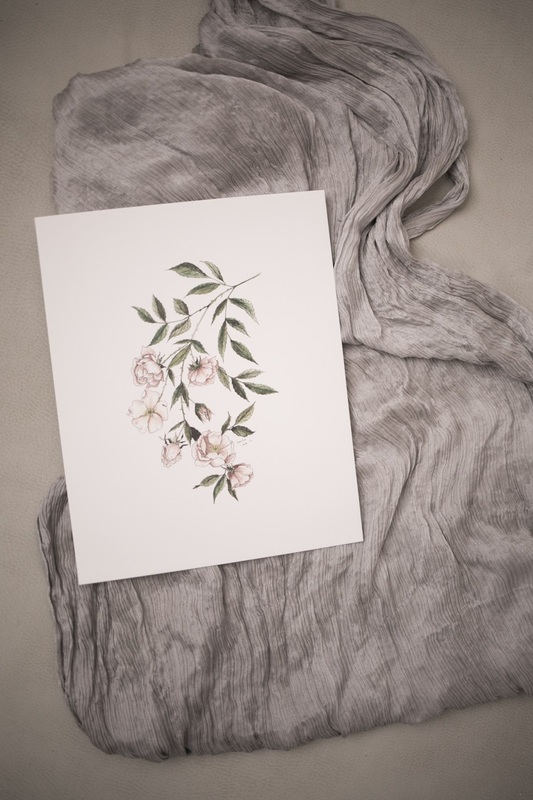 If you'd like to purchase a botanical print or are interested in having Esther create your wedding invitations, then you can look at her portfolio and shop here. Photography by BethCath, Emilie Anne Szabo, Megan Morgan, and Alyssa Wilcox. All Rights Reserved. Thank you for your kind words! Esther was so sweet to share and she is such an inspiration!